The Urban Politico: Has Ted Cruz Painted Himself Into a Corner? During the 2012 election, while America re-elected Barack Obama into his second term, the great state of Texas elected a man to the United States Senate who, how shall we say, marches to the beat of his own drum. 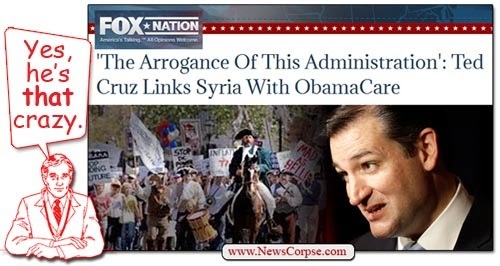 A self-proclaimed Tea Party member, Senator Ted Cruz ran on a campaign of platitudes that mainly centered around opposing anything and everything that involved Barack Obama. And so, based upon this promise to stop Obama, he was elected to the Senate. In the 1 year that he's been Senator, he has done his best to stir up controversy at every possible turn. Ted Cruz' strategy is that he wants to be either a presidential nominee or part of that presidential process. He has no strategy to get along and make friends and produce legislation in the Senate. So, you know, for Senators who think that a Freshman comes in and makes friends and tries to work with his own party if not people across the aisle, this is not his strategy. He is now well known and doing very well in fund raising and well known with his base in Texas and his strategy is all about 2016. It has nothing to do with getting anything done in the Senate. But as the government shutdown heads into day three, a number of Republican senators privately blame the Texas freshman for contributing to the mess their party finds itself in. And now that they’re in it, they say it’s up to Cruz to help find a solution. 1. Assuming for a moment that Cruz is a "natural born citizen", what chance does he have at winning the Republican Primary in 2016? 2. What about the General Election in 2016? 3. What does it say about the House Republicans who followed Cruz' inspiration to shut down the government without an end-game strategy? 4. Is Ted Cruz the "Sarah Palin" of the U. S. Senate?